My Iver Johnson Truss-bridge bicycle was originally motivated by a Smith Motorwheel fitted alongside the rear wheel. The Iver Johnson is in excellent restored, running order with later steel wheels and tyres. Like other late 19th Century/ early 20th Century bicycles it’s fixed pedal drive. 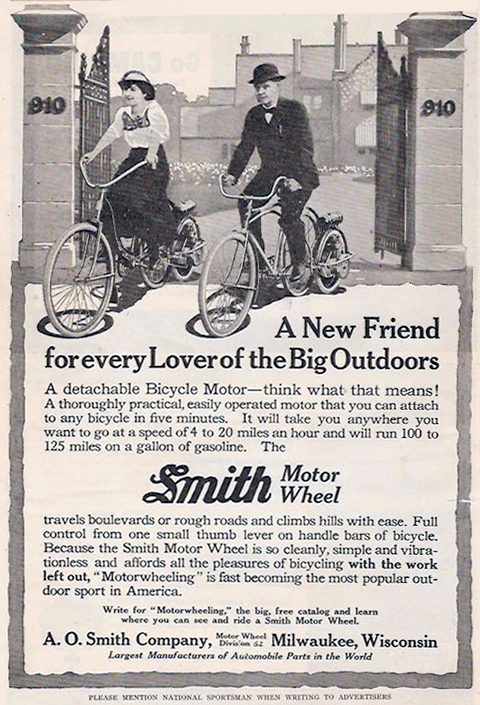 The Smith Motorwheel was in excellent unrestored, original and complete condition. I sold the Motorwheel and kept the Iver Johnson cycle. 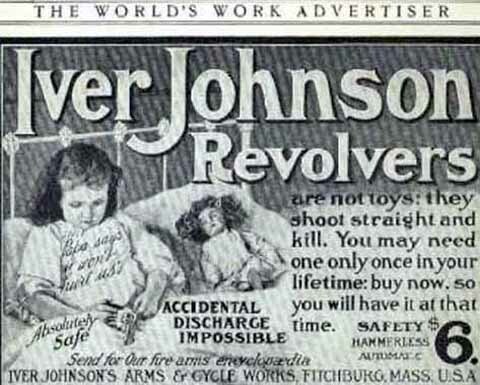 Both Iver Johnson and A.O. Smith are interesting American companies, with well-documented histories. 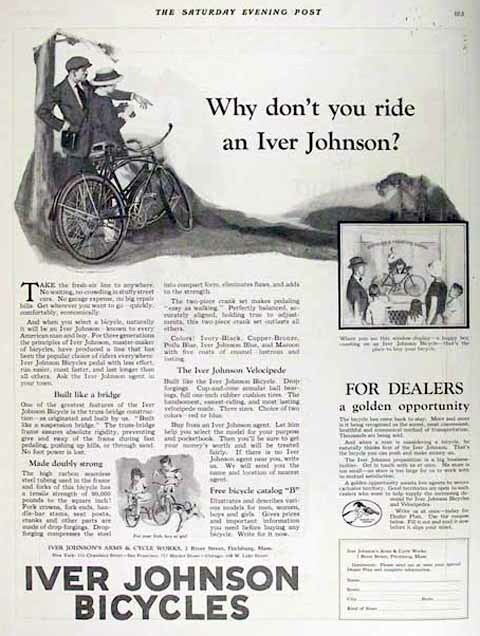 ‘Iver Johnson Arms & Cycle Works’ of Fitchburg, Massachusetts, was a leading American manufacturer of arms and cycles in its day. 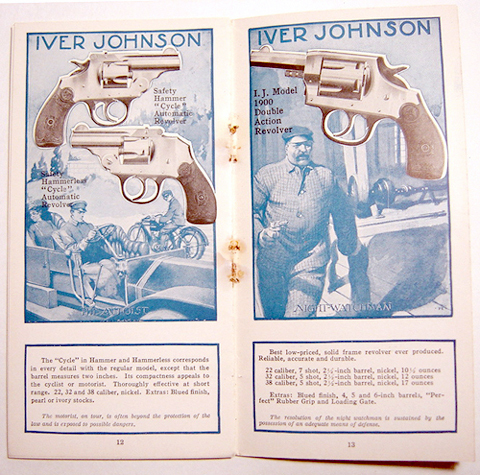 Their popularity in the 21st Century is due to their excellent advertisements, particularly for the Iver Johnson pistol with their famous safety hammer. The restored Iver Johnson in this auction is frame number 368912. The Iver Johnson truss-bridge design ran from 1909 until the early 1920s, and was very popular as it was well-priced and a well-made lightweight cycle. The ‘motobike’ versions had a pretend petrol tank under the crossbar. In 1871 Iver Johnson joined Martin Bye to form the Johnson Bye & Company, merging his own (1841-1895) and Martin Bye’s gunsmithing operations. During this period, Johnson and Bye filed for and received several new firearms features and firearms feature improvement patents. Their primary revenues came from the sale of their self designed and manufactured inexpensive models of revolvers. Not much is known about Martin Bye, as there is very little documented information about his life. However, there is more documented information on Johnson. Iver Johnson is documented as having immigrated to Worcester, Massachusetts from Norway in 1863 at the height of the American Civil War, a time when gunsmithing was a welcome skill in the country. Johnson was a gunsmith by trade at the time, but also worked as an inventor in his spare time, which would come in handy later on as he sought new and creative uses for his partially idle manufacturing equipment, a thought process which would eventually lead him and his heirs to diversify the corporation’s businesses. His early work involved not only gunsmithing locally in Worcester, MA, but it also included providing designs and work to other firearms companies (notable Allen & Wheelock for whom he made so-called “[pepperbox]” pistols). He married Ms. Mary Elizabeth Adams on April 9th, 1868, in Worcester, with whom he had 3 sons and 2 daughters over the next several years. Little is known of Martin Bye. He and Johnson filed jointly for and were awarded multiple patents together, mostly related to firearms designs, beginning in 1876. The company’s name changed to Iver Johnson & Company in 1883 upon Johnson’s purchase of Bye’s interest in the firm. Bye continued to work in the firearm industry for the remainder of his life. 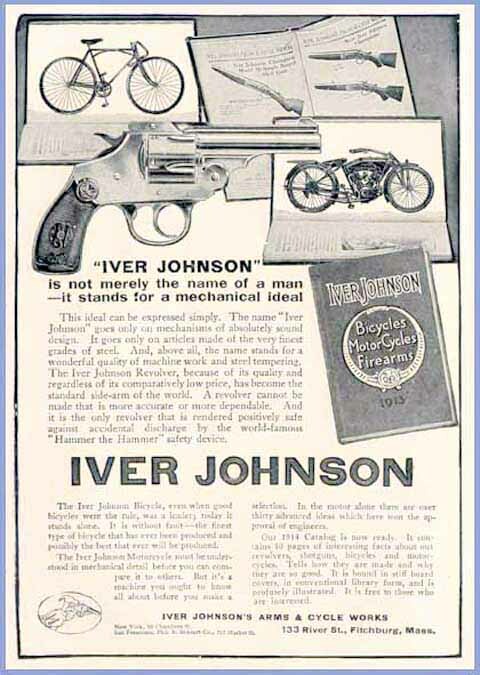 The company’s name changed again to Iver Johnson Arms & Cycle Works in 1891, when the company relocated to Fitchburg, Massachusetts, (sometimes incorrectly referred to as “Fitzburg”) in order to have better and larger manufacturing facilities. The Iver Johnson Complex, as it is known today, resembles other abandoned Industrial Revolution-era properties in New England. As has been the trend, the complex is often a target for real estate developers who intend to exploit its buildings’ industrial brick aesthetics and open floor plans to create retail, residential, or other types of usable space. 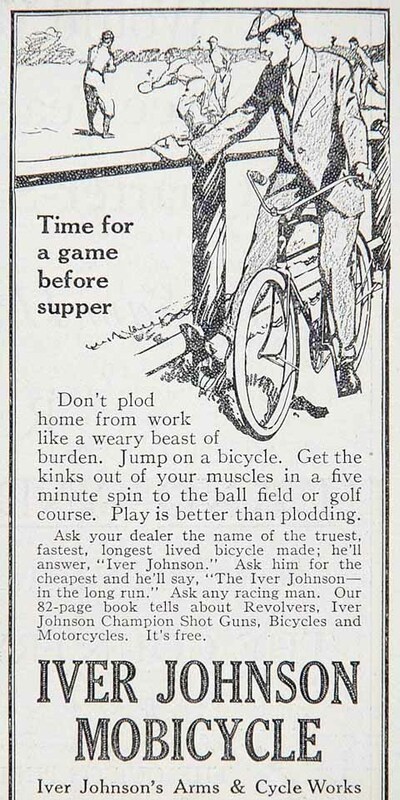 Iver Johnson died in 1895, and his sons took over the business. Frederick (born 10/2/1871), John (born 6/26/1876), and Walter (birthdate unknown), had vastly different levels of involvement in the company ranging from executive leadership to barely any involvement at all. They shepherded the company through a phase of expansion, as bicycle operations grew, then converted to motorcycle manufacturing and sales. They also saw the growth of the firearms business and the eventual restructuring of the company to focus on firearms and related business as they divested non-firearms concerns, such as the motorcycle business, in the face of growing firearms demand, World War I’s armaments industry expansion, and other factors. As family ownership waned and outside investment via publicly traded stock and mergers/acquisitions/partnerships took hold, the company changed ownership and moved several times during its operation. 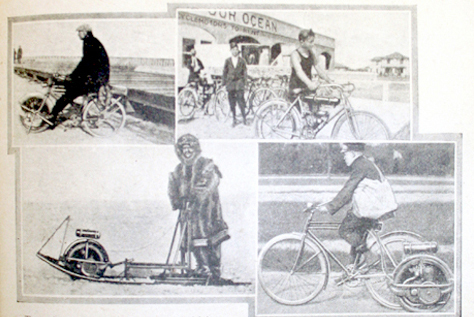 The company eventually dropped “Cycle Works” from its moniker when that part of the business was shut down. The business successfully weathered the Great Depression (in part thanks to higher rates of armed robbery crimes, which helped maintain demand for personal firearms) and was buoyed by the dramatic increase in the market for arms leading up to and during World War II. As a result of changes in ownership, the company had the first of two major relocations in 1971 when it moved to New Jersey. It moved again to Jackson, Arkansas, before it finally ceased trading under its own name in 1993, at which time it was owned by American Military Arms Corp (AMAC). Three years later, when A.O. Smith died, his son Lloyd Raymond (Ray) was made president. Ray’s was not just a dynastic leadership, however. Both A.O. and L.R. Smith were later inducted into the Automotive Hall of Fame and the Wisconsin Business Hall of Fame. The 23-year-old former company secretary had previously proposed manufacturing improvements that multiplied A.O. Smith’s production rate seven times: by 1916, the company was manufacturing 800,000 frames per year–half the auto industry’s needs. Called ‘decisive, restless and a profound thinker’ by corporate historians, Ray Smith also propelled the family company into new ventures. 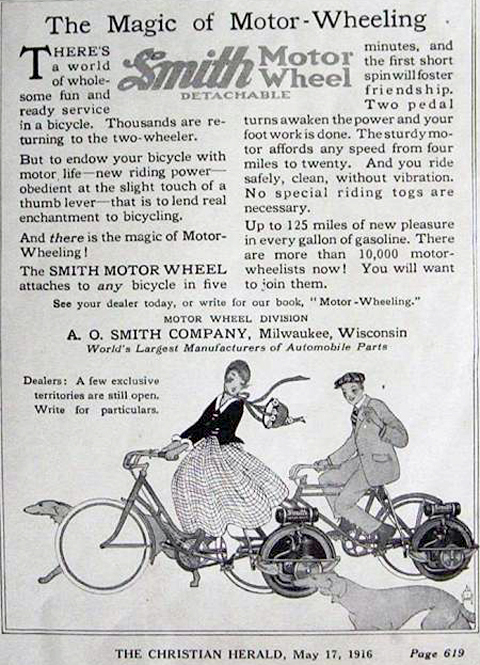 Smith bought a license to manufacture ‘The Motor Wheel,’ a small gas engine that could be attached to a bicycle’s rear wheel to make a ‘motorbike.’ The company sold 25,000 of the vehicles nationwide from 1914 to 1919, and even applied the technology to a small wooden ‘sports car’ called the Smith Flyer. Here are a few shots of the Smithless Iver.